It is my prayer today that you look up; Despite the darkness around you, look up. The stars are coming out. 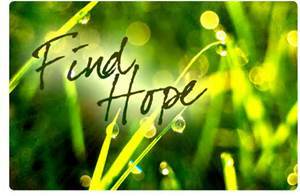 Hope is always there – for hope is in God; And God never leaves us, or disappoints us. May you find your hope today and hold on for dear life. It will transport you to all the abundant things that God has planned for you. Just curious. What is your definition of hope? What brings you hope when you feel down? I would love to hear from you.